We head off to Broken Hill and arrive there less than two hours later. We need to do some washing and shopping so we find a laundromat and put our clothes in the washing machine. We go shopping for food and then while Kelly looks after the drying, I go shopping for beer, wine and petrol. We then go to a local park that has an old mine-shaft head set up as a display and have lunch here. After lunch we go towards Menindee. Our aim is Kinchega National Park. I have been here twice before, in 1978 and 1981. It is an excellent tar road and the 110 kilometres soon pass. We stop to look at the water channel between two of the Menindee Lakes and it is obvious that the lake adjacent to the national park is totally dry. On my last visits it had been full to the brim. 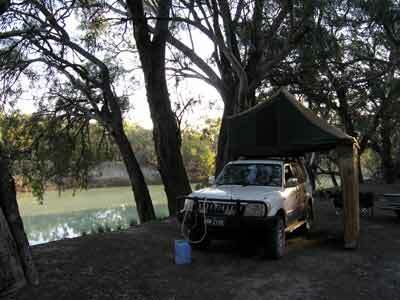 We head into the national park and decide to follow the Darling River drive to find a camp site. We pick out a couple as been the best and then do a bit of sightseeing. We stop at the site of the wreck of the paddle steamer PS Providence that blew up in the 1800s when the boiler was left unattended and it built up too much pressure. 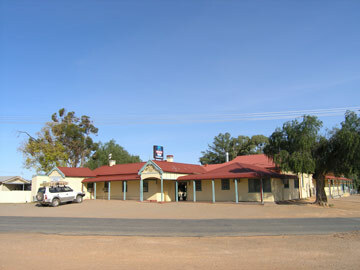 We return to Menindee to have a beer at the famous Maidens Hotel. This pub was originally built in the early 1800s and Burke and Wills stayed here at the start of their fateful inland exploration. From the outside the pub looks the same but as I enter I realise it is totally different. In April 1999 the pub almost totally burnt to the ground. Apparently the local copper put a beer carton in the fire place and part of it rose up the chimney and became stuck there. It smoldered and during the night it set fire to the ceiling and roof which was (as was the time in the 1800s) constructed of timber, fibres etc. Unfortunately, when rebuilding the hotel, it was not built to the same layout or as an historic recreation. While it is a very nice pub, it would have been nice to have it look much the way it did (inside) as when Burke and Wills were here. Anyway, we have a couple of beers before heading back to the river and finding that our preferred camp site was still vacant. 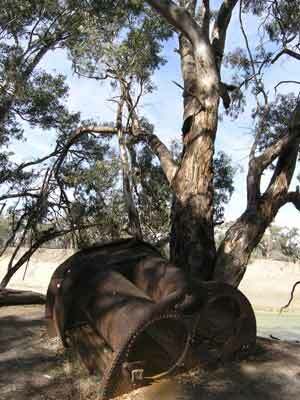 This was a very large area with a fireplace, right on the river with lots of beautiful red river gums. We set up camp and have nibblies and a few more beers as well as a great dinner. No stars tonight as the trees totally block out all but a tiny area of sky. 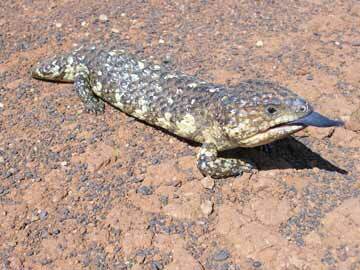 The plan is to spend all day in Kinchega NP and even very early it is very hot and windy. We head off after breakfast for the old Kinchega homestead. Once we get away from the river the wind, a hot north-westerly, is howling. At the old homestead the sand is blowing all over the place. We explore the well sign-posted site, but it is not all that comfortable. From here we go to the location of the newer homestead. At this spot the shearing shed and shearers' quarters are located. A section of the shearers' quarters is the "office" for the park but there are no staff any more (unlike my last visits). The very small visitor centre is interesting and the shearing shed still great to explore. 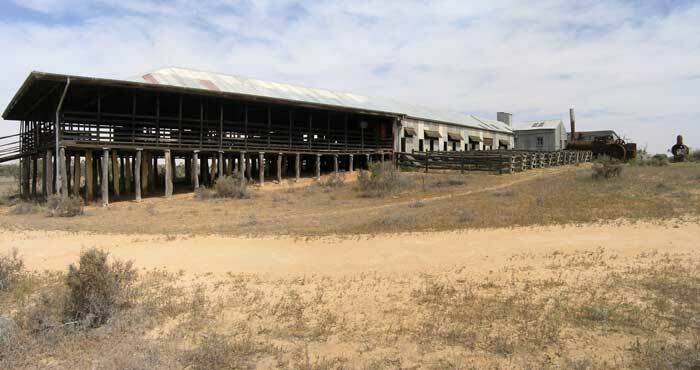 This was the largest shearing shed in the Southern Hemisphere. The displays set up by Peter Evans back in the late 1970s and early 1980s are still there, although some work certainly needs to be done or else they will fall apart. You can stay in the shearers' quarters but this has to be booked in advance (as far as I can tell). It is now over 40ºC and the wind is gale force. 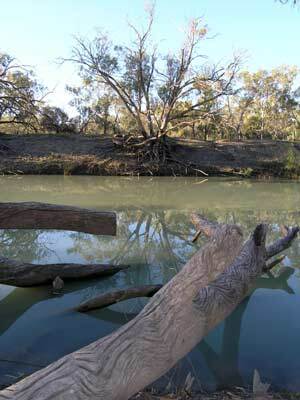 We head out to see the Menindee Lakes outlet channel which is at the southern end of the park. The wind is really blowing now and ahead the road is obscured by a dust storm. We can barely see a hundred metres! We pass through the storm and end up at the vast outlet channel. The second lake here is also totally dry. We decide to explore the camping area and picnic areas along the lakes edge and take this road on the way back towards Menindee. It is really quite surreal as we drive along. Tumbleweeds blow in their hundreds across the track and the dust swirls off the dry lake beds. We arrive at a camping area and decide to have lunch here as it is a little protected from the wind and the sun by the trees. There are a couple of very large red kangaroos here, the only ones we see in Kinchega. The car fridge is having trouble keeping up with the heat but the contents are still cool. After lunch we head to town and then decide to look at the lakes north of the main road. Well, at least these have some water in them. Looks like the authorities have decided to keep what water there is in two smaller lakes to minimise evaporation. Up here is the inlet channel from the Darling River. This also has some camps sites, not too bad but certainly not as nice as where we are camped. We go back to the pub for a couple of cool beers in the relatively cool hotel. Nice! Back out into the heat. It is late in the afternoon by now but the temperature is still in the high 30s and the wind still blowing. Back at the campsite it is a bit better, the huge gums providing protection from both the wind and the sun and also there is no dust or sand blowing around. A few things about this trip to Kinchega. 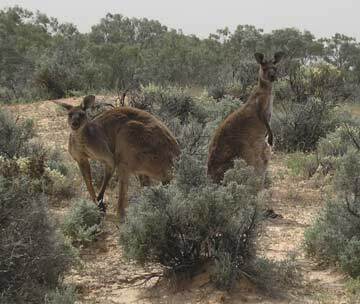 We have not seen a single kangaroo apart from the two seen in the middle of the day nor any emus. On my previous trips they were everywhere. The drought has certainly impacted the animals bad here. The Darling River next to the camp site has a fair bit of water in it but it is not flowing at all. I had thought we would see lots of roos coming down at sunset to drink here but that was not the case. The birdlife was very good, with lots of cockatoos and galahs as well as waterbirds. A baked dinner tonight with a few beers and wines makes a perfect end to what was a bit of an uncomfortable day.